Who says sandwiches are just for picnics? Loaded with protein and veggies ― and full of flavor ― these sandwiches are perfect for a quick and satisfying meal. Enjoy them with a knife and fork at dinner, then pack up the extras and send them to school with the kids for lunch the next morning. Or save them for yourself: The California Nicoise, hummus and grilled veggie, and pork sandwiches are particularly delicious ― if not even a tiny bit better ― the next day. 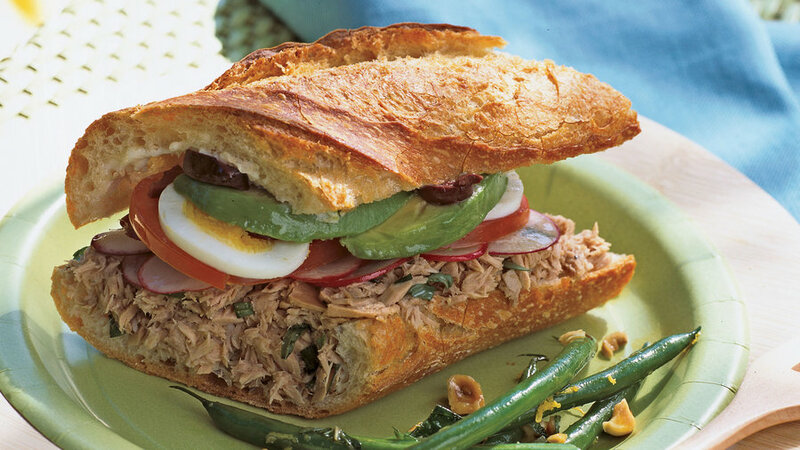 Inspired by the classic French salad, this fancy tuna sandwich takes a Western turn with sourdough and avocados. We love it on crusty sourdough, but it can be a bit messy to eat. For a tidier bite, try soft Italian-style bread. Mounded with pickled onions and tender prosicutto, this tasty open-faced sandwich is perfect for eating with a knife and fork, but can easily be closed up and packed away for lunch. This sandwich is a specialty of Hoi An, a charming old fishing village in central Vietnam. Its interplay of textures ― cold cuts, ground pork, greens, and cucumbers ― is distinctive. Choose a sweet baguette with a light, slightly soft interior and thin, crisp crust. This one’s quick to begin with but to save even more time, you can use store-bought hummus instead of making your own. The oldest diner sandwich in the book becomes a great summer meal when you make it live up to its name ― cook it on the grill.